They’ll be the ones to catch again at Dover. Busch said the pole was about six to eight spots higher than he thought he might have qualified in the No. 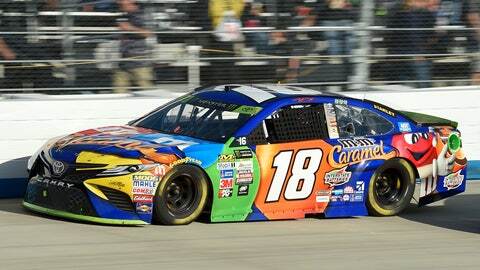 18 Toyota for Joe Gibbs Racing. “It’s certainly better for us not to go out there and have to bust out a really fast lap,” he said. Martin Truex Jr., Brad Keselowski and Clint Bowyer round out the top five. Joey Logano, Kurt Busch, Ryan Blaney, Chase Elliott, Kyle Larson, Aric Almirola and Alex Bowman start sixth to 12th. Busch came to Dover celebrating a bigger milestone than a pole. Busch and his wife Samantha, who have been public about their struggles with infertility, announced this week they are ready to start in vitro fertilization (IVF) to try and have a second child. The Busches used IVF to conceive their son, Brexton. They hope for a daughter this time. Here’s what else is going on at Dover. Jimmie Johnson can extend his own track record with a 12th win at Dover. But he’ll remain stuck on seven championships. Johnson, tied with Dale Earnhardt and Richard Petty for most career Cup titles, blew a chance to snap a 58-race losing streak last week at Charlotte Motor Speedway. Johnson tried to dive inside and pass Martin Truex Jr. with two turns remaining on the roval course and he ended up spinning. Johnson collected Truex, who spun off course, and Johnson’s car came to a stop. Ryan Blaney scooted past for the surprise victory. “It was nice to be up there mixing it up with the guys. I haven’t been in that position in a while,” Johnson said. Johnson would have qualified for the next round of playoffs had he just settled for second place. Instead, Johnson wound up eighth and out of the playoffs. He had few regrets about the decision. The 42-year-old Johnson has slogged through the worst season of his 17-year career. The Hendrick Motorsports driver swept Dover in 2002 and 2009 and also won races in 2005, 2010, 2012, 2013, 2014, 2015 and 2017. NASCAR announced this week a 2019 rules package, which includes the phasing out of restrictor plates. NASCAR wants to lower the horsepower in Cup cars at 21 races, all on ovals larger than 1.2 miles, from 750hp to 550hp. The 14 races on tracks shorter than 1.2 miles in length will use the same sized spacers from this season. NASCAR believes the adjustments will create more passing, more drafting and afford a better throttle response for the drivers. NASCAR said it didn’t make the moves to promote pack racing, but the package will slow down cars on the series’ biggest tracks. Logano, the 2015 Daytona 500 champion, said slower could be better. “At a lot of race tracks I think it will be better and at some race tracks it may be similar to where we’re at, so we’ll just have to wait and see,” he said. Dover opens the second round of the playoffs, with the next two races at Talladega and Kansas. The 12 playoff drivers — especially the 10 who don’t drive for Roger Penske — might feel some added pressure to win at Dover to earn the automatic berth into the next round. Team Penske drivers Keselowski and Logano have combined to win five of the last seven races at Talladega. “It seems like that’s where we are because we’re pretty aggressive when it comes to superspeedway racing,” Penske said.